You can kind of see it in this picture. That was Saturday, and Sunday was even more so. I thought I’d taken pictures of the epic storm, but no, I guess I was battened down outside of Mocha’s stall, watching the typhoon remnants rage. It was a good show. 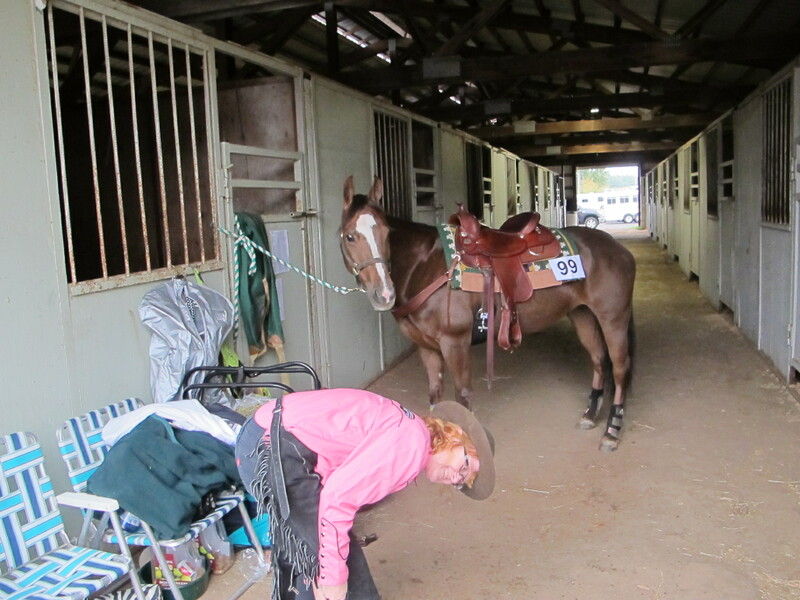 I put up detailed results on Facebook and I won’t go into those details here–except to say that Mocha did very well in Trail classes. Half of our ribbons were firsts and seconds overall, and we placed in over half of our classes, with the majority of placements coming from all three judges. Not too bad for folks who only show once a year! Part of the excellent results came from focused training. 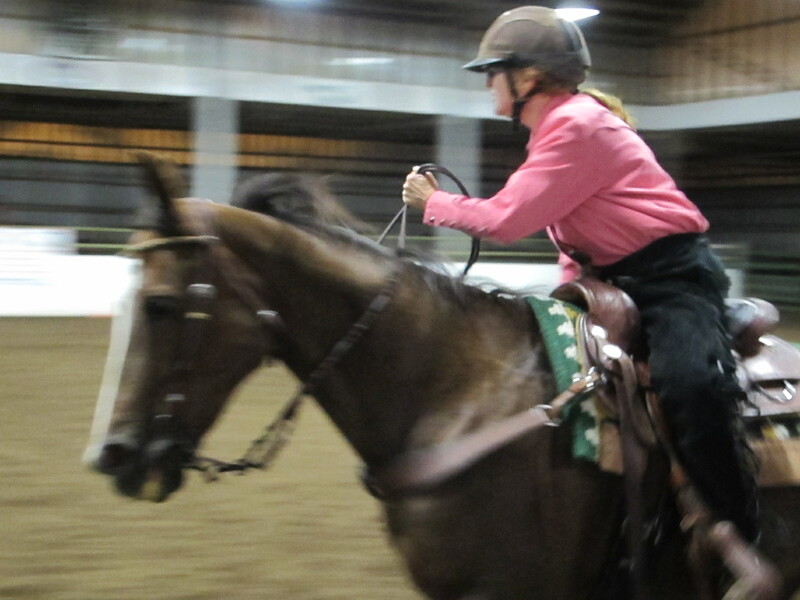 I started prepping for this show in July, and, despite a few sidetracks from horse and human health stuff, we kept to a pretty consistent training and conditioning schedule. 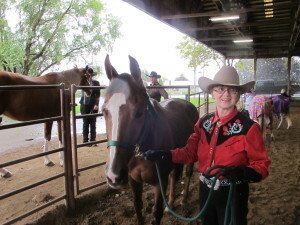 In any case, the storm was in full steam when we got to the fairgrounds. In past years, it’s been a pretty fall show with decent fall weather. This year–nope. Full-blown mid-latitude cyclone. At least it wasn’t as crazy as the infamous 1962 Columbus Day storm that did significant damage and was quite powerful. 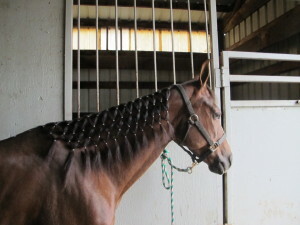 This was the mane styling for Mocha for Saturday and Sunday. 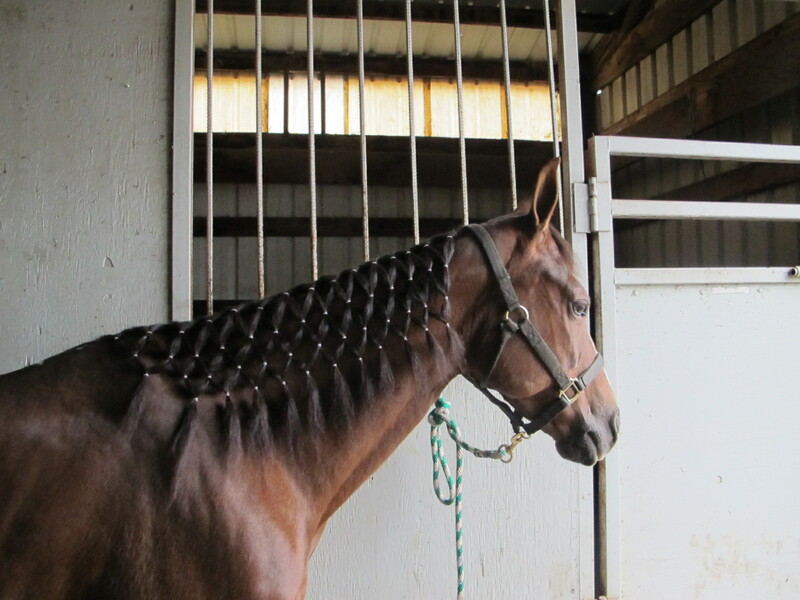 Friday night reining, we just went without braids. Just before reining classes, putting on my chaps. I’m still wearing my wool hiking hat from REI, to be swapped out for helmet (Friday night) or expensive felt show hat (Saturday and Sunday). 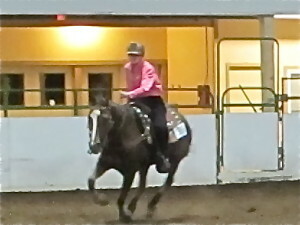 Rail view during reining. She kept trying to drift out, didn’t want to steer right, I wasn’t locking into her, she wasn’t happy with her boots and the footing. But we still placed in one class and would have placed in the other if I’d not lost count of my last spin. Thundering along. Her ears are forward, she’s looking where we’re going, at least. And then there was Trail. 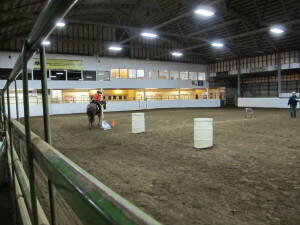 Pulling the drag around the cone. We had two late nights, with the weather making things nasty and late on Saturday. 99W closed down and we had to come home by way of Forest Grove and Hillsboro. 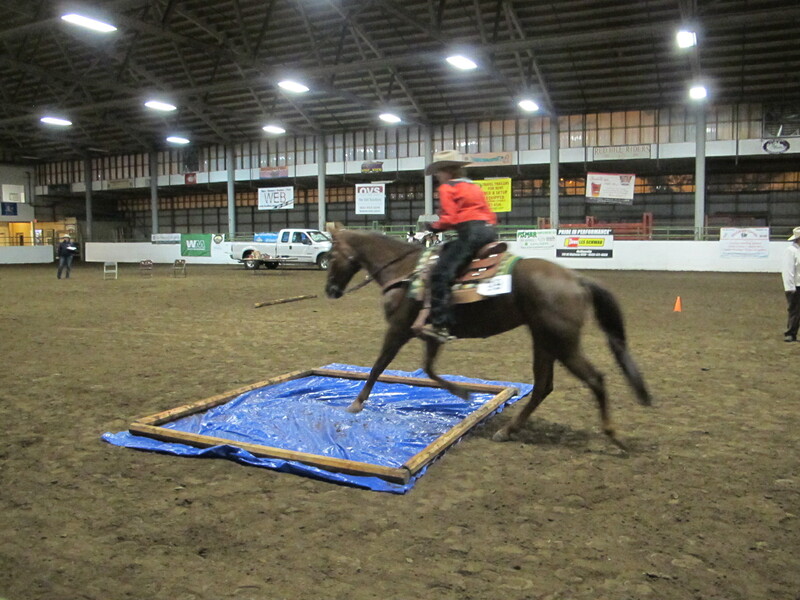 Nonetheless, I’m proud of my little mare. We’ve worked hard and we did well at this show, all things considered. She did a good job, and, thanks to a nice bale of orchard grass hay, stayed very happy all weekend munching away on good roughage to keep her calm and her gut stable. 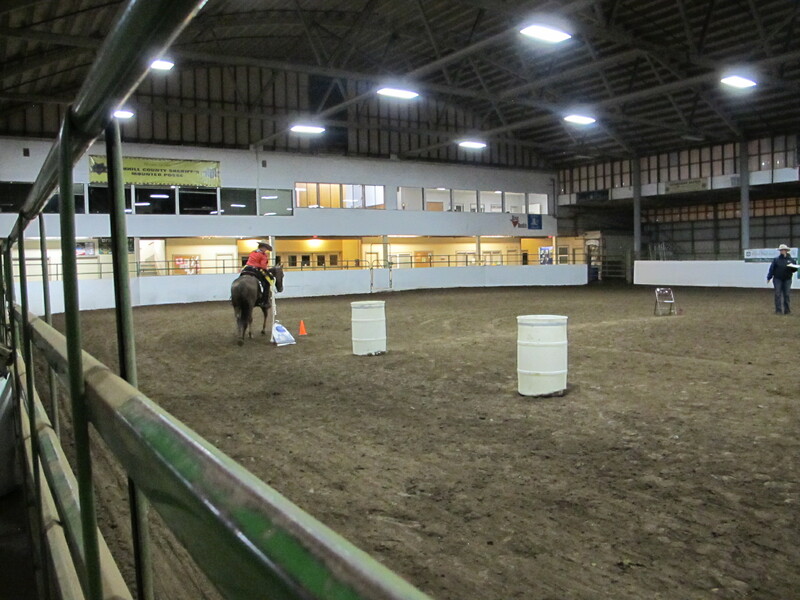 A good horse show. I’m happy.